Carnival Glass is a term given to pressed, iridized glass manufactured in the United States and other countries from 1907 through the1930s. This mass-produced hand shaped glass found a market with the average housewife who couldn’t afford expensive art glass made by Tiffany or European glass houses. These pressed glass items, like the expensive Art Glass pieces, were sprayed with metallic salts (dope) during and after the shaping of the molded glass. 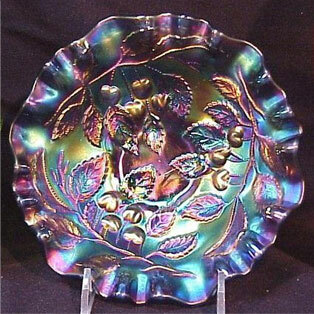 These iridescent sprays were applied to items made in many different base glass colors known today as Marigold, Greens, Blues, Purples, and White. The glass was sold in department and five-and-dime stores for very small amounts of money. 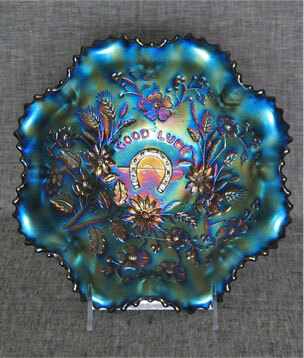 Most of the Carnival Glass factories were located in the Midwest where natural gas was abundant and labor costs were cheap. 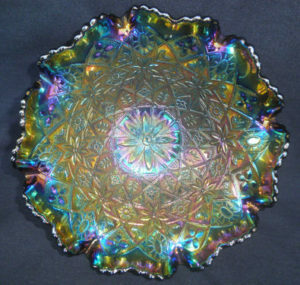 Multiple patterns, base colors, shapes and iridescent treatments have resulted in literally thousands of possible combinations of Carnival Glass items. The items sold reflect the social customs of the era – butter dishes and water pitchers, tumblers and fruit bowls were commonly found in American households. Fancy flower epergnes and massive punch sets were found in church halls and social clubs where people met for special occasions. 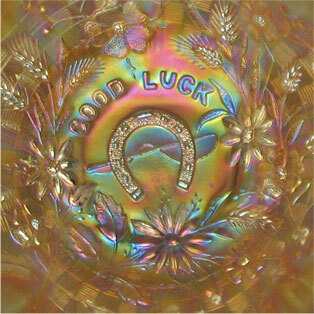 The term Carnival Glass was applied late in the 1930s many years after the last pieces were made. Having gone out of favor, remaining stocks of this glass were sold to traveling carnivals, circuses and theatres where they were given away as prizes and premiums – ‘Carnival Glass’.